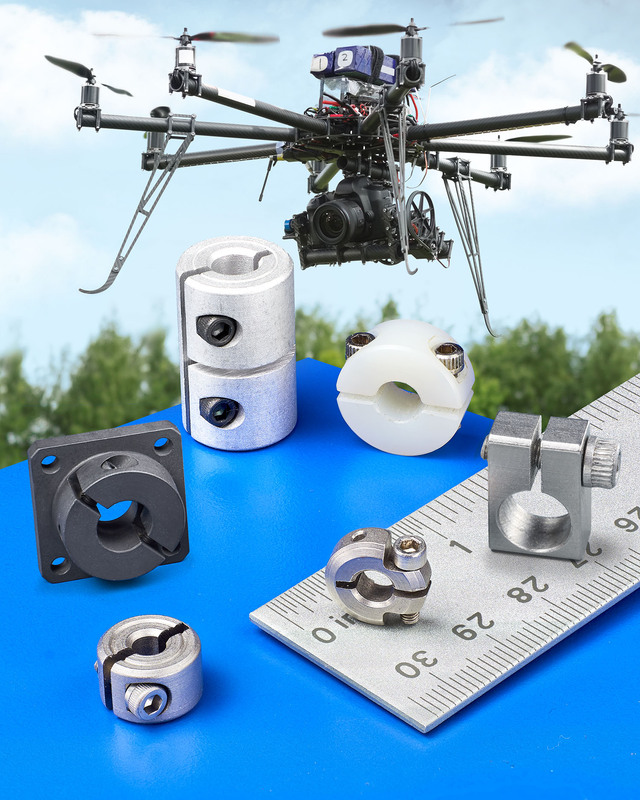 A broad range of standard and custom shaft collars, couplings, clamps, and mounts for attaching cameras, sensors, and other devices to drones and UAVs are being introduced by Stafford Manufacturing Corp. of Wilmington, MA. Stafford Parts for Drones can include shaft collars, couplings, and flange mounts for attaching and repositioning structural components, cameras, sensors, and other devices. Featuring O.D.s as small as 0.500” and bore sizes from 0.062”, they can be manufactured to specification from various materials such as aluminum, stainless steel, titanium, brass, and plastics. Enabling OEMs to match design requirements for weight, strength, corrosion-resistance, and other factors, Stafford Parts are suitable for commercial and military applications. Offered in sizes up to 6.00” I.D., depending upon configuration, collars and clamps are available in one-, two-piece, and hinged styles. Couplings and mounts also provide many design options. Stafford Parts for Drones are priced according to type, material, size, and quantity. Price quotations are available upon request.